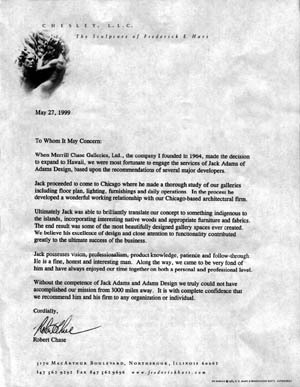 When Merrill Chase Galleries, Ltd., the company I founded in 1964, made the decision to expand to Hawaii, we were most fortunate to engage the services of Jack Adams of Adams Design, based upon the recommendations of several major developers. Jack proceeded to come to Chicago where he made a thorough study of our galleries including floor plan, lighting, furnishings and daily operations. In the process he developed a wonderful working relationship with our Chicago-based architectural firm. Ultimately Jack was able to brilliantly translate our concept to something indigenous to the islands, incorporating interesting native woods and appropriate furniture and fabrics. The end result was some of the most beautifully designed gallery spaces ever created. We believe his excellence of design and close attention to functionality contributed greatly to the ultimate success of the business. Jack possesses vision, professionalism, product knowledge, patience and follow-through. He is a fine, honest and interesting man. Along the way, we came to be very fond of him and have always enjoyed our time together on both a personal and professional level. Without the competence of Jack Adams and Adams Design we truly could not have accomplished our mission from 3000 miles away. It is with complete confidence that we recommend him and his firm to any organization or individual.